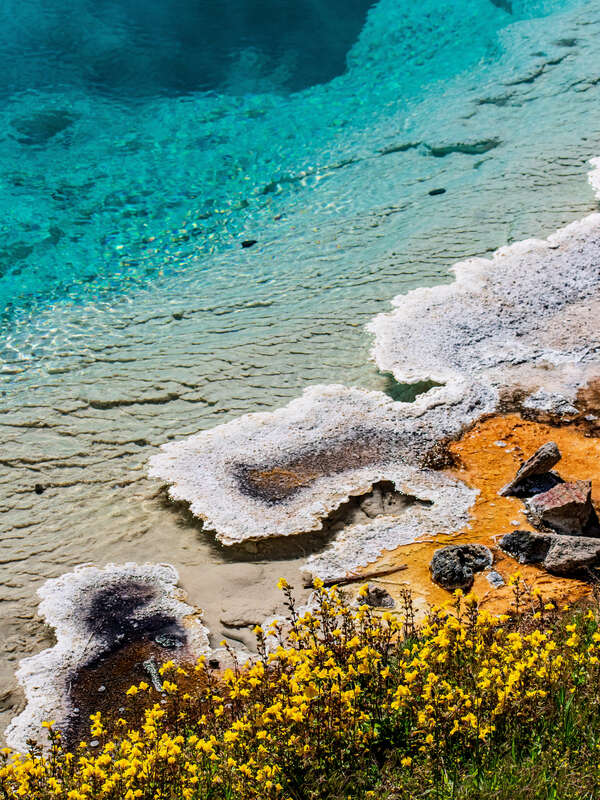 I don’t know if it’s just me, or does every American dream of visiting Yellowstone National Park at least once in their life? 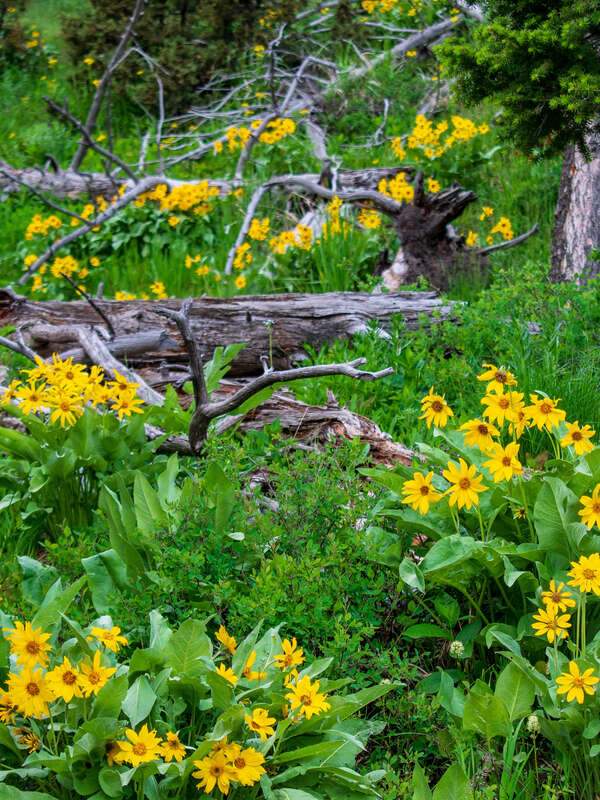 It’s the first National Park that was ever created (shout out to the O.G.) 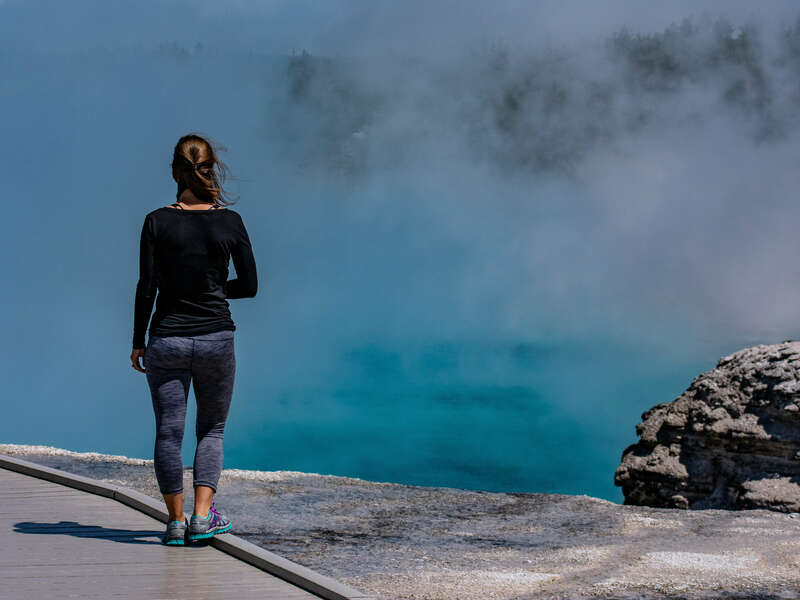 and is one of the most unique parks because it’s diversity in scenery and geothermal activity. 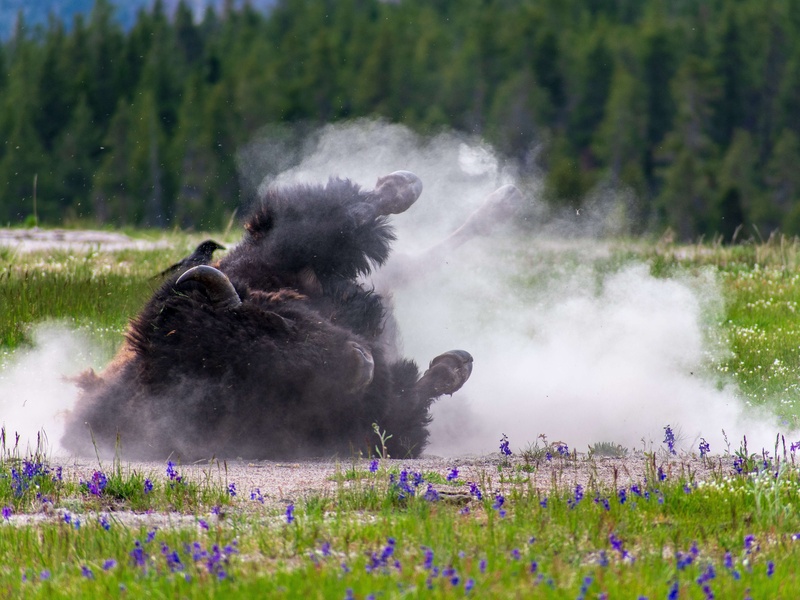 Not only can you marvel at the brightly colored yellow rocks in Yellowstone Canyon, watch Old Faithful (or one of the other several hundred geysers) erupt, but you can also observe wolves, pronghorns, bears, bison, birds and more in their natural habitat. 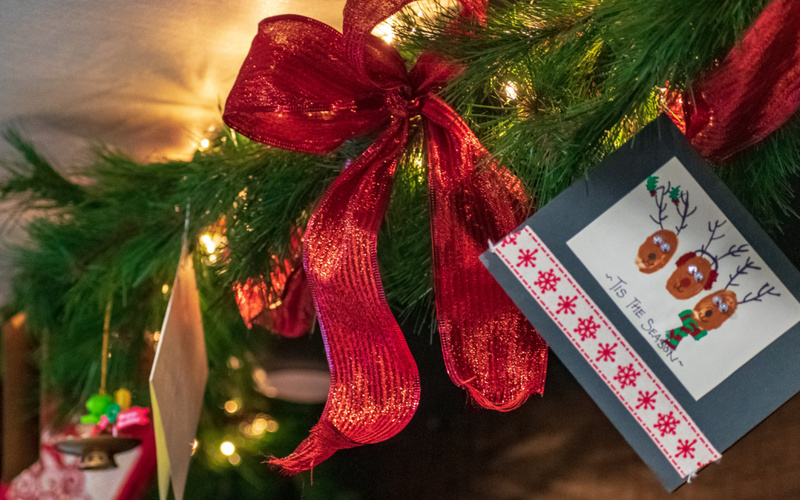 It’s a place like no other and we wanted to share the beauty of this park with you. 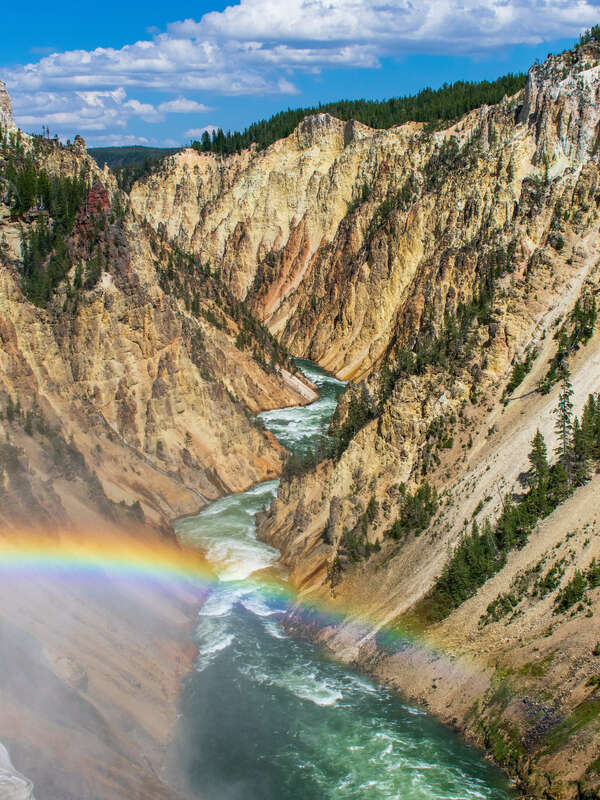 If you’re planning a trip to Yellowstone, or wondering what the top things to do in Yellowstone are, watch the video below and get excited for the amazing trip you’re about to have! As you saw in the video, it was our first time at Yellowstone. We were excited but also overwhelmed by the size of the park and all there was to do and see. 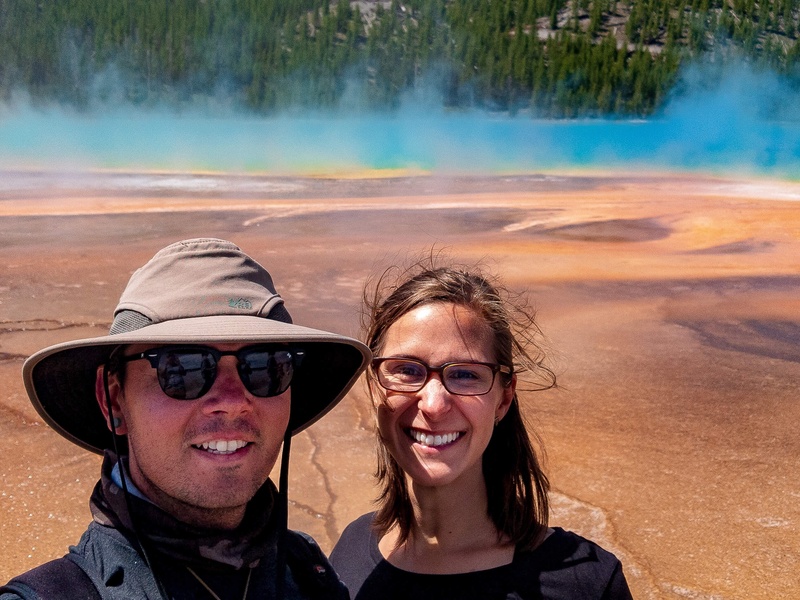 We had no idea what the top things to do in Yellowstone were before we arrived. 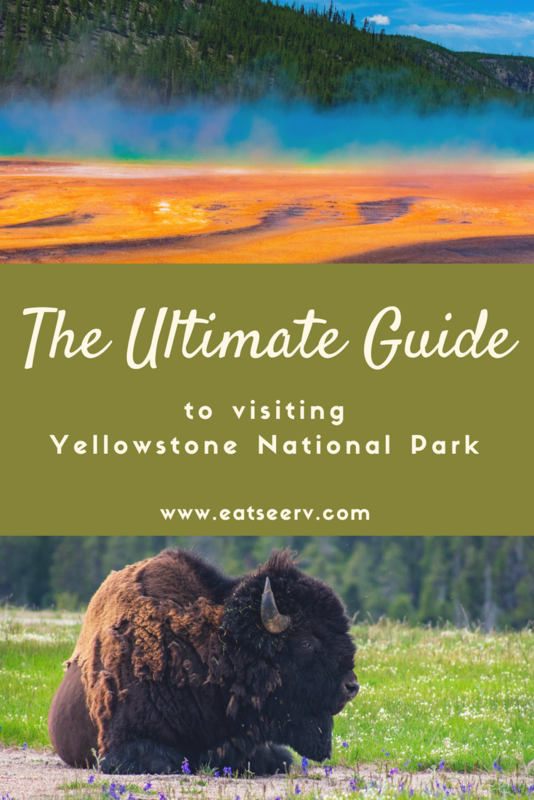 So rather than just share our experience in Yellowstone, we wanted to go a step further and create a guide to the top things to do in Yellowstone that will help you plan your trip. 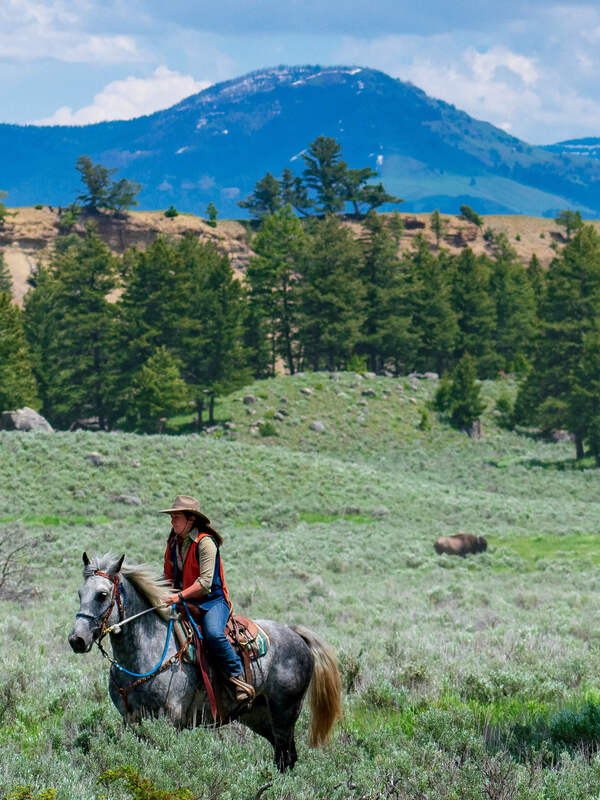 Hopefully the guide below will help you get lay of the land, a good idea of the top things to do in Yellowstone, and your “must see” items so you can make the most of your trip to Yellowstone. 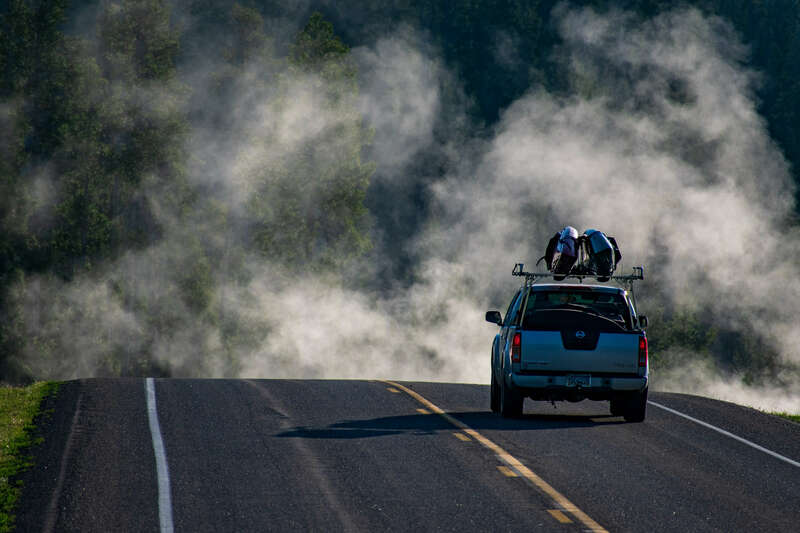 There is a lot of driving involved with Yellowstone. After all it is over 2.21 million acres of national park! 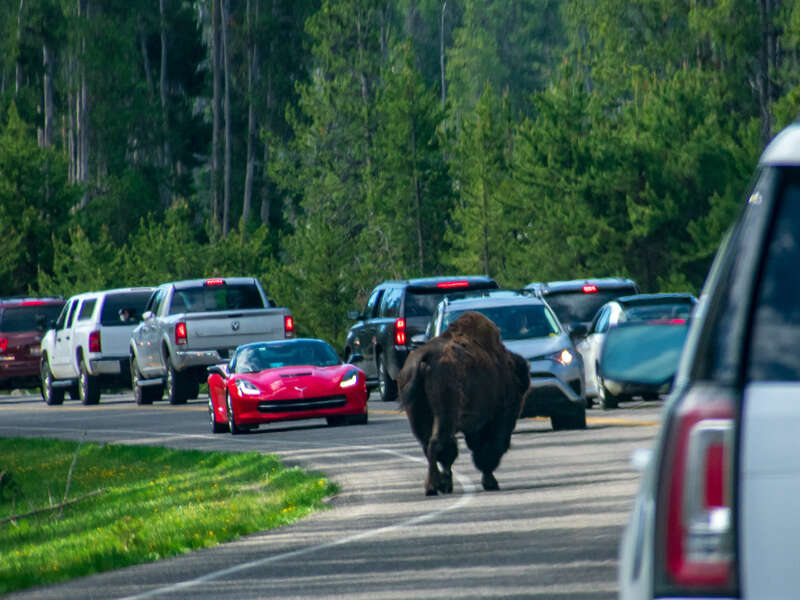 It can also take longer than expected to get from destination to destination within the park, largely due to animal sightings and bison traffic jams (yes bison traffic jams is 100% a thing in Yellowstone). You will not be able to see this park in just one or two days! 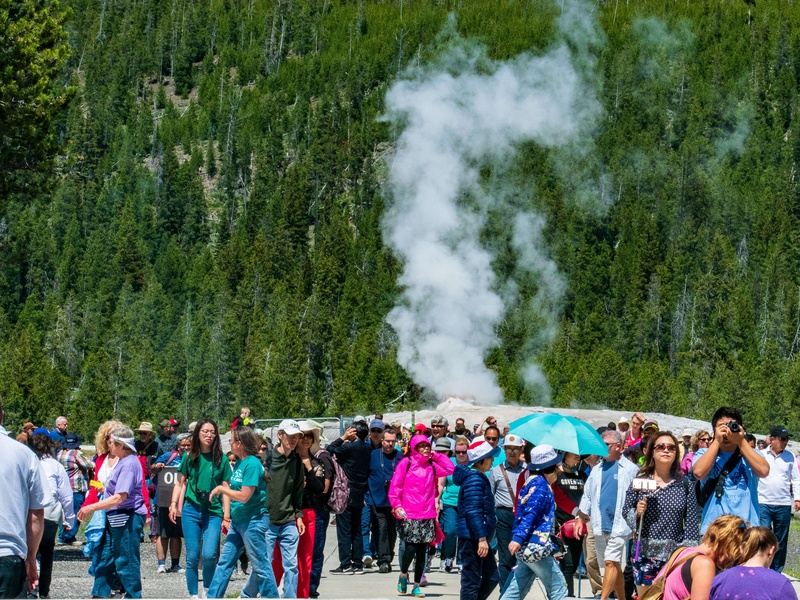 If you’re short on time, you could probably see Yellowstone in three days but you would definitely be cutting the experience short and rushing through several parts of the park. It would be ideal to spend at least 5 days in the park, especially if it’s you’re first time. 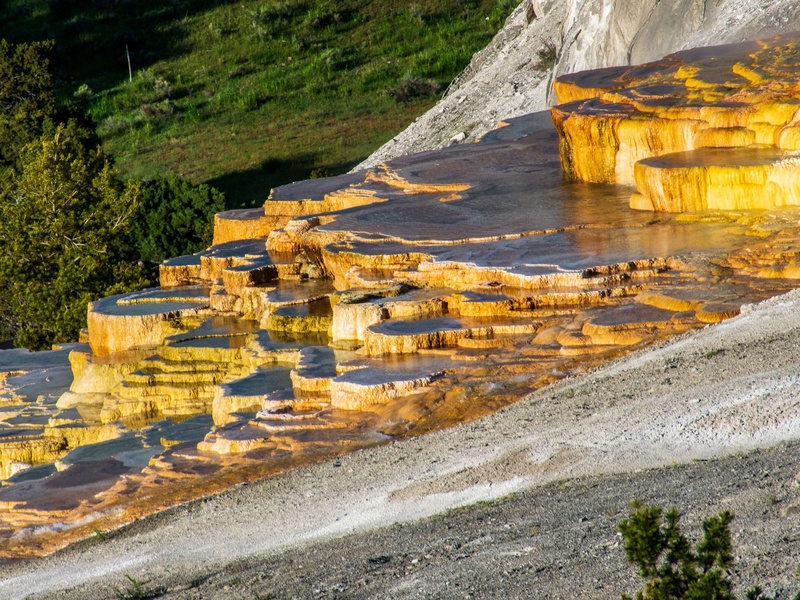 Yellowstone is broken up into four sections, North, East, South, and West and there are several “big destinations” throughout those areas. See the full Yellowstone Map here. 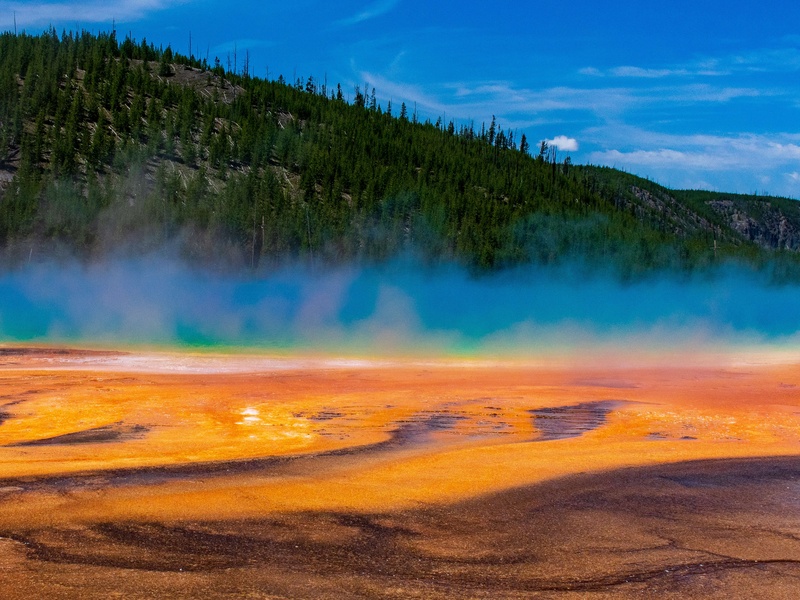 Below is our guide to the top things to do in Yellowstone, broken into the geographical area of the park. We feel it’s much easier to plan your trip this way. If you are camping or staying within the park, you have the advantage of being much closer to each destination and reducing some drive time.This is a park you’ll want to visit over and over again so plan on coming back and getting to explore the areas you enjoyed most in your first visit more thoroughly. We always suggest visiting the national parks website to see if there is any important alerts or notifications prior to going. If you plan on visiting in summer there will likely be road or trail closures for repairs which will all be mentioned on their site. 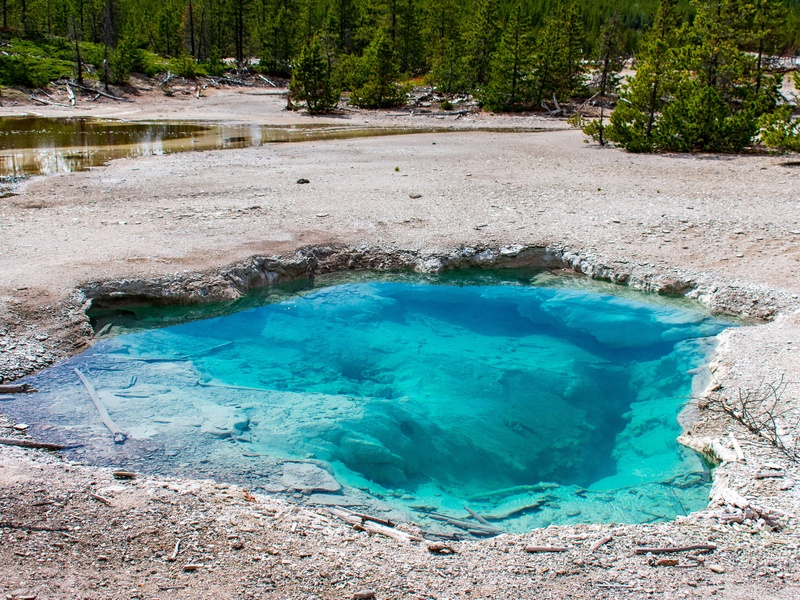 So here it is, our guide to the top things to do in Yellowstone! 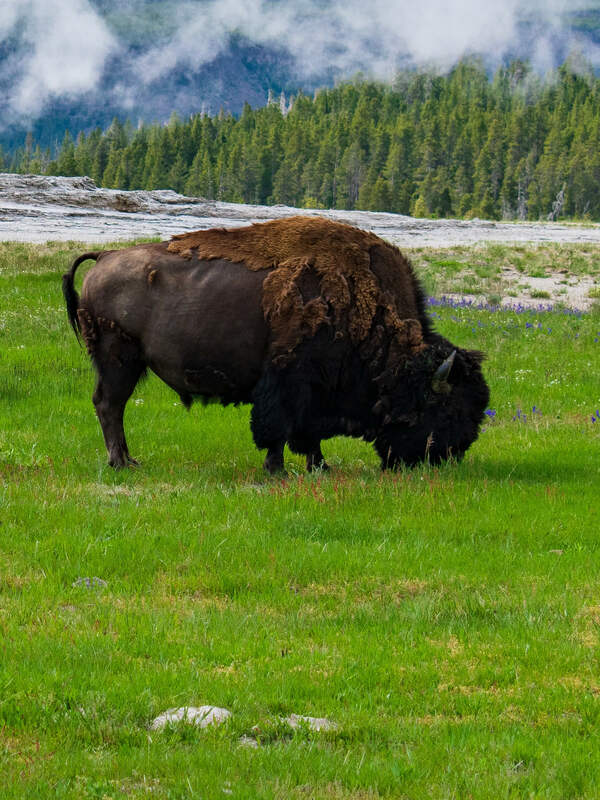 Camping in yellowstone There are twelve different campgrounds within the Yellowstone National Park boundaries. Five of which accept reservations up to one year in advance. These campgrounds fill up close to one year in advance. 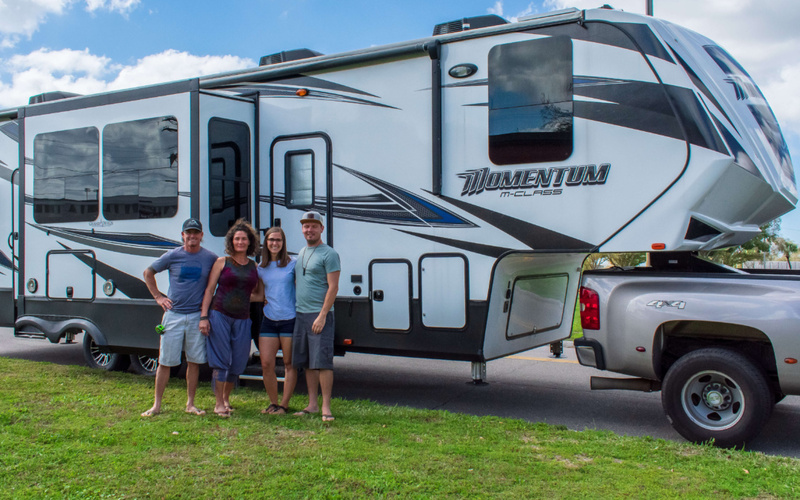 If you want a prime spot at a campground like Canyon or Madison, you’ll have to plan ahead. The other seven campgrounds are first-come-first-serve. We suggest getting there before the sun rises to snag a spot in line. 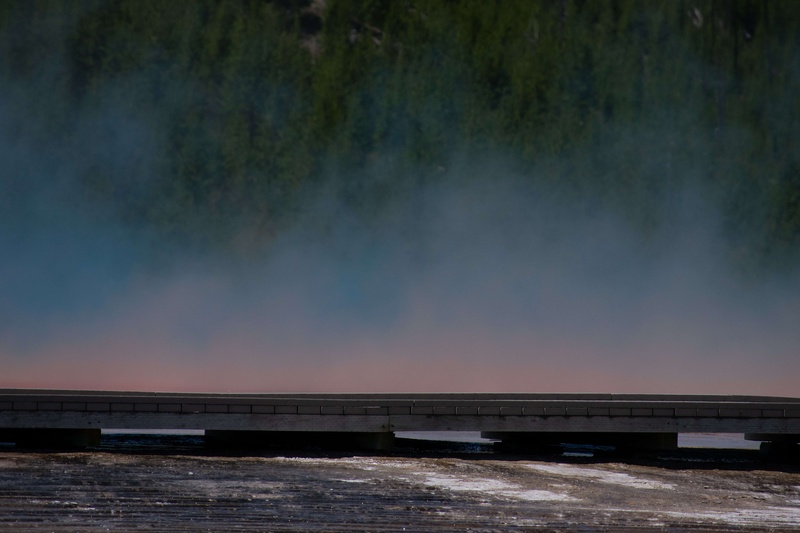 There is only one campground in all of Yellowstone that has hookups and it’s also the most remote of the campgrounds from much of the “main attractions”, Fishing Bridge RV Park. All of the other campgrounds in Yellowstone have no electricity or water at the sites (although many have water to fill your tanks or a dump station). Many prohibit use of generators and almost all cannot accommodate rigs larger than 35 ft. It’s best you check with the actual NPS website here for information on what is open, their rules, regulations, and amenities. If you do not have reservations there are campgrounds outside each of the entrances of the park that can accommodate the overflow from Yellowstone. The positive here is that most have electric or water on site and are cheaper than the dry camping spots within the park. The negative is that you are outside of the park. Even though we were only 10 miles from the West Entrance at our campground, Rainbow Point Campground, it took us nearly an hour to reach Madison Campground (the western campground in the park) each day. If you want to see some of the other options outside of the National Park itself, here is the website. That website has more campgrounds listed than All Stays or Campendium did, so you may want to save it. 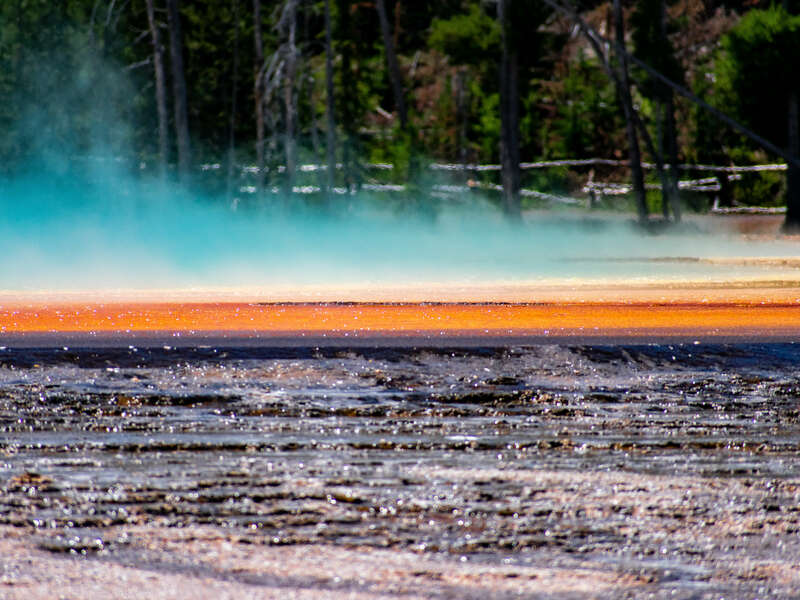 This is what people think of when they think of Yellowstone, at least we did! It’s called Old Faithful for a reason, because you can rely on it’s eruption pattern, at least for now that is. 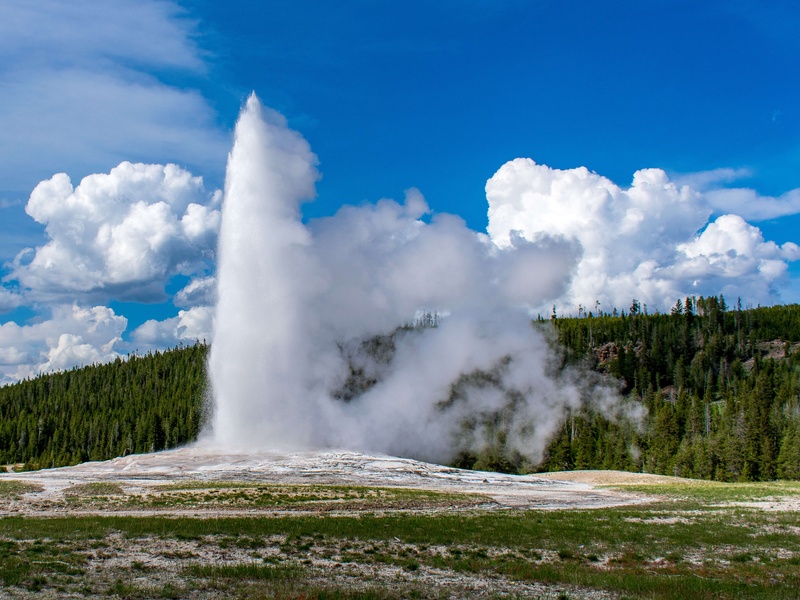 Since 2000 Old Faithful erupts every 45 – 120 minutes, shooting water as high as 185 ft into the air! It’s not the largest (that’s steam boat geyser). Seeing this go off was the highlight to our trip! We felt oh so American watching it erupt. We stayed for 2 full eruptions. 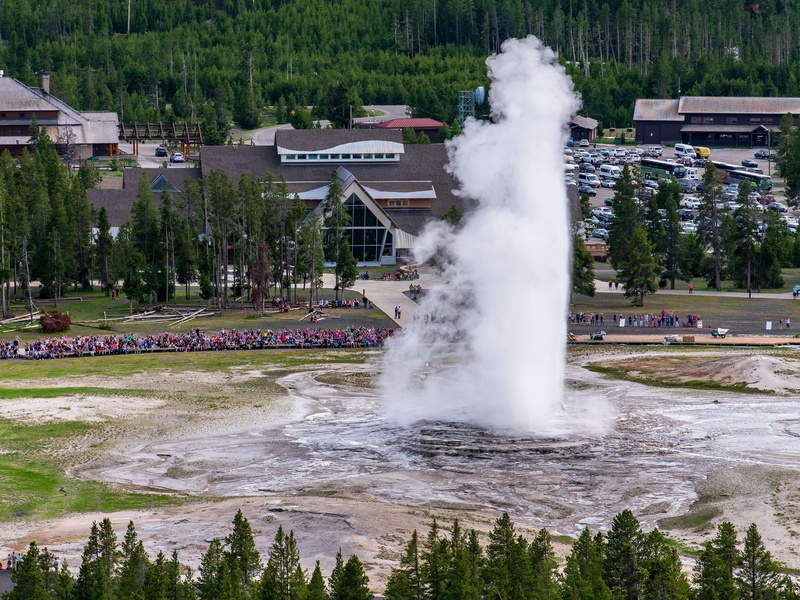 Old Faithful is located in the southwestern part of the park and is a huge hub. There is a hotel/lodge, restaurant, gas station, post office, visitor center, and gift shop. That means it has a lot of people and a lot going on. We suggest visiting this in the morning, so you have time to hang around if you missed the eruption after you arrived. The visitor center has some useful information and a video on Yellowstone that’s worth a listen. The National Park Service has a website page dedicated to announcing the predicted eruption times for Old Faithful, so plan accordingly. You can also call in to Yellowstone (307) 344-7381 and push the correct extension to hear the next predicted time of eruption. 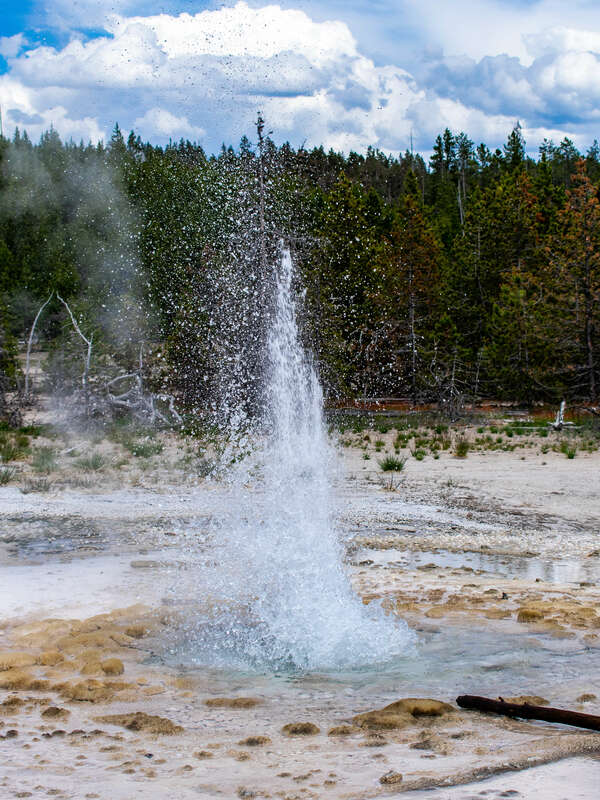 Don’t skip out on exploring the rest of Upper Geyser Basin, the area that surrounds Old Faithful. 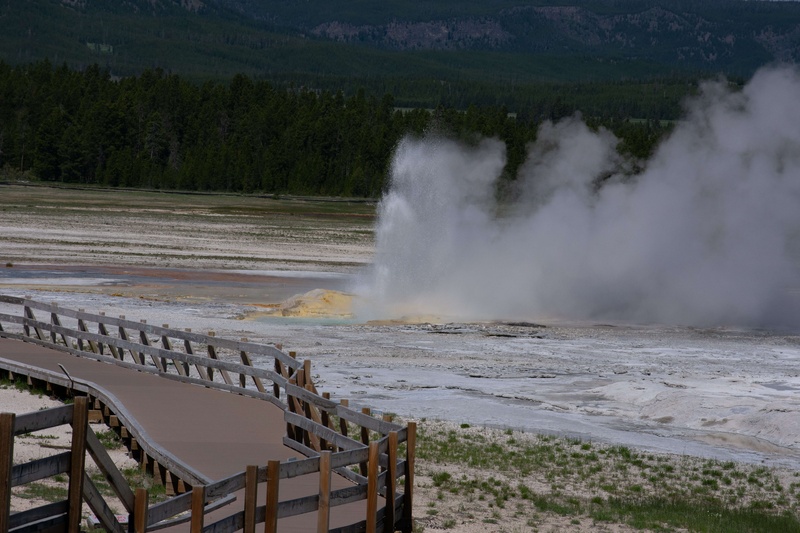 Most people park their cars, watch Old Faithful erupt, then leave abruptly and call it a success. Unfortunately, they are only experiencing part of it. If you have some extra time, or want to take full advantage of Upper Geyser Basin take a nice walk along the Lone Star Trail. It’s 5.3 miles roundtrip and is nearly completely flat the entire trail, with over half of the trail being paved cement or wooden walkways. If you have more than a day or two this is definitely worth your time. Biscuit and black basin This will be a quick stop along our western route through Yellowstone. If you’re super short on time you can skip these, but if you’re dedicating a full day to the West side of the park definitely stop here and take in the area. Midway Geyser Basin This was Dennis’s favorite part of Yellowstone; specifically, Grand Prismatic Spring. 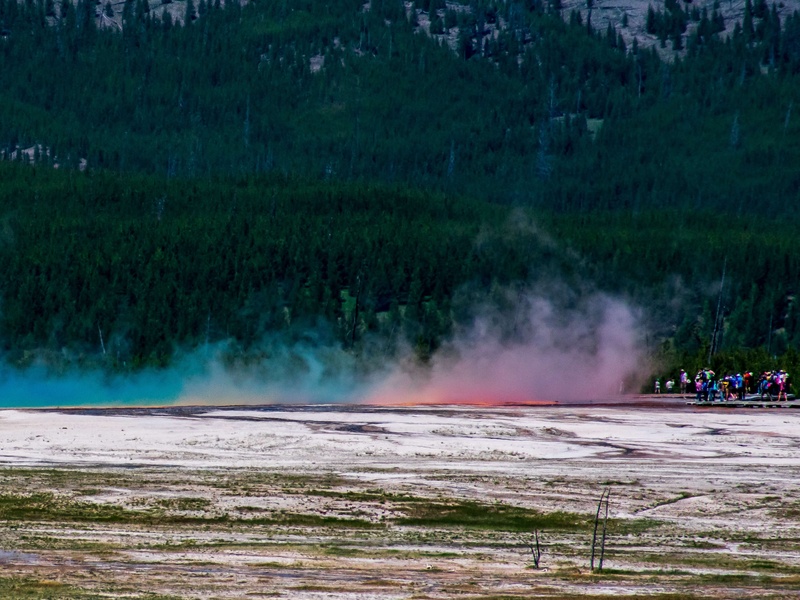 You’ve probably seen a photo from National Geographic of a geyser bursting with colors, welp here it is! It’s one of the most incredible things we’ve ever seen. 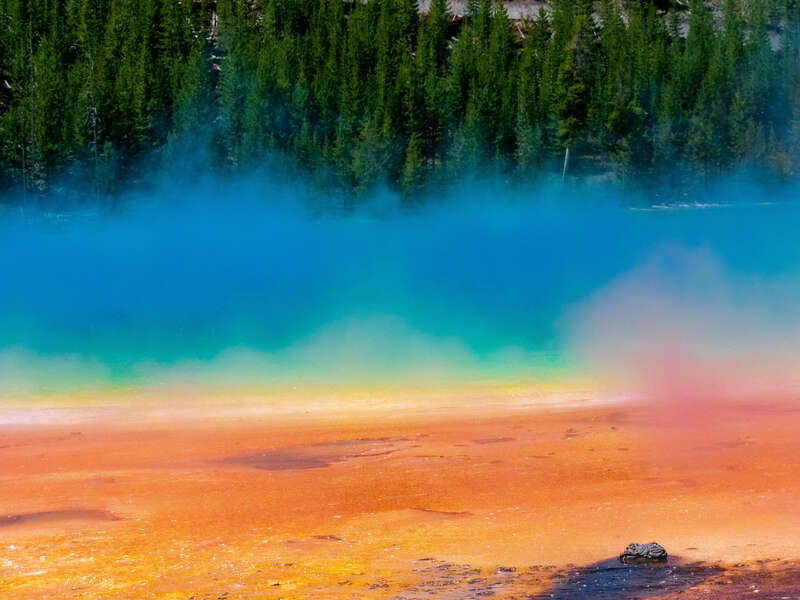 The colors are so vivid and as the steam rises it displays the colors as a rainbow within the mist. It really is something special. 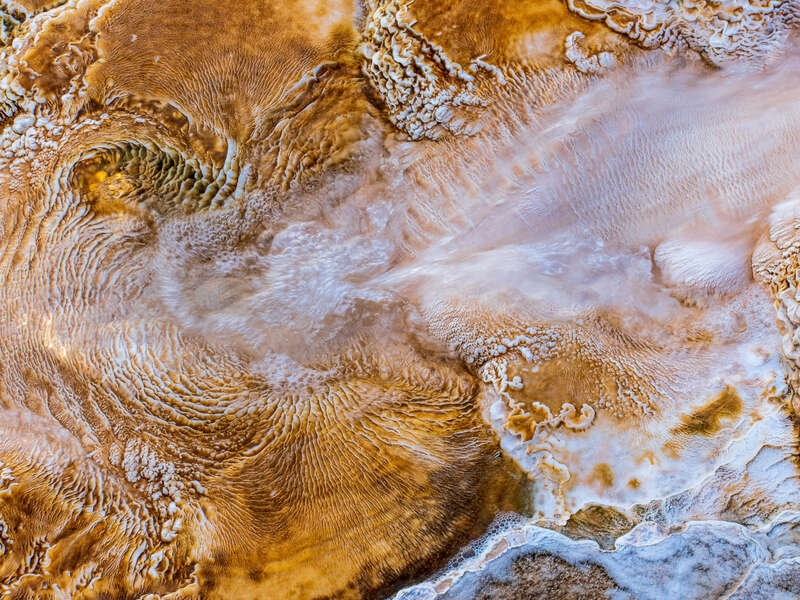 While there are a ton of other geothermal formations here like hot springs, fumaroles, and mud pots, Grand Prismatic is the main attraction by far. We also really enjoyed watching the geothermal water cascade into the firehole river down below. This place gets busy so come early or come late but you don’t want to miss it. lower Geyser Basin Lower Geyser Basin was our very first stop in Yellowstone. We were in awe of how beautiful the springs were, the diversity in the geothermal formations, and honestly the park as a hole. We couldn’t believe what we were seeing. Then we ventured on to Midway Geyser and eventually Upper Geyser and Norris Geyser and realized how small Lower Geyser basin really is. artist paint pots This can be a quick stop on your trip as the hike to see the paint pots is only 1 mile roundtrip. There are stairs and a steepish hill, so make sure you can make it to the top. You can see a great example of Liz’s favorite type of geothermal activity, mud pots! norris Geyser Basin Plan to spend some time here! 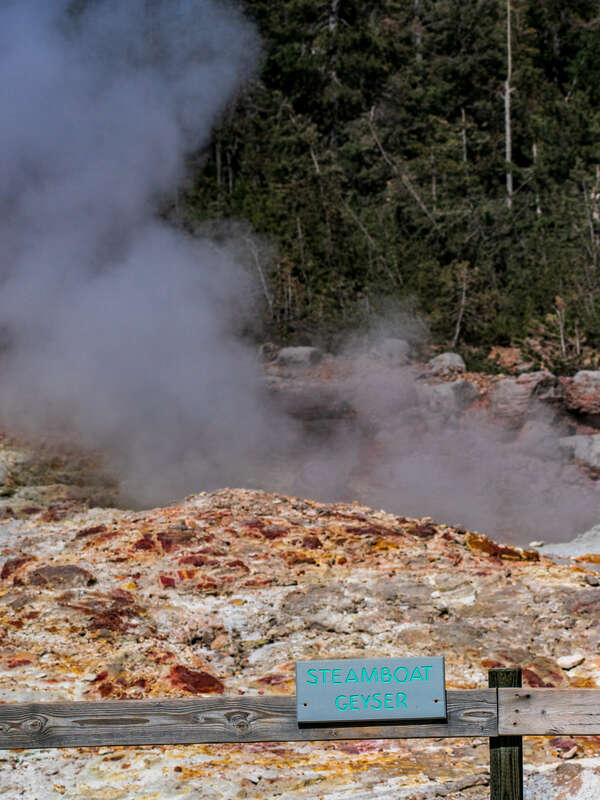 We walked around the boardwalks for nearly three hours enjoying the various geothermal formations, learning about the different geysers, and if you’re one of the lucky ones – watch steamboat geyser erupt. Steamboat geyser is the largest geyser in all of Yellowstone and before 2018 hadn’t erupted since 2014. It has erupted a ton in 2018, to date over 13 times. It can shoot up to 300 ft high and I’ve been told is a sight to behold. We were there just 4 days after it’s first eruption in 2018 which had a lot of people talking. We were disappointed we missed it but we will be back to see it! East side of yellowstone The east side of the park has much less geothermal activity, although there is evidence if you look closely. This part of the park is more of the traditional forest and mountain experience you would expect from national parks. On the east side you can enjoy beautiful mountains, grassy meadows, canyons, waterfalls, lakes, and rivers. The list below is going from Southeast to Northeast on the east side of the park. Hayden Valley This passage is from the southern part of the park headed toward Canyon Village. It’s known for its abundant wildlife. 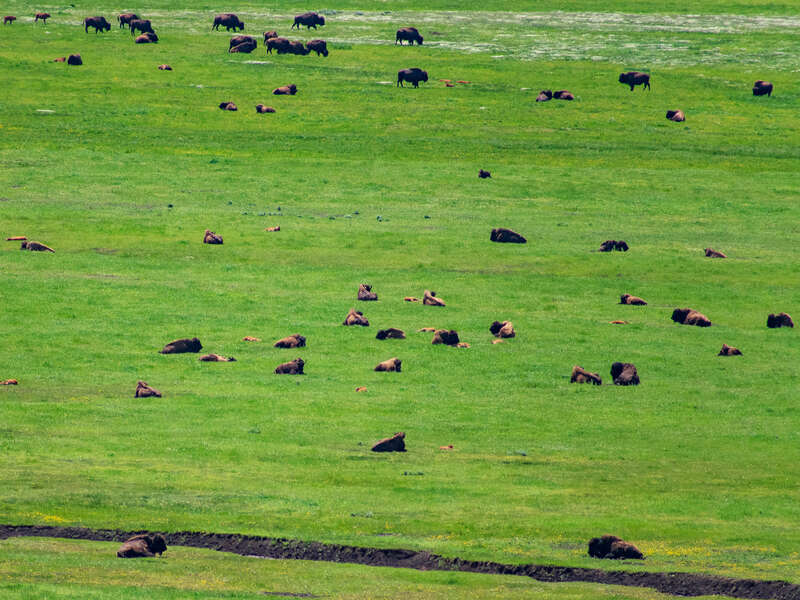 If you’re looking to see Bison in their natural habitat this is a great place to stop. If you do this drive at sunrise or sunset your likelihood of seeing other animals will increase. 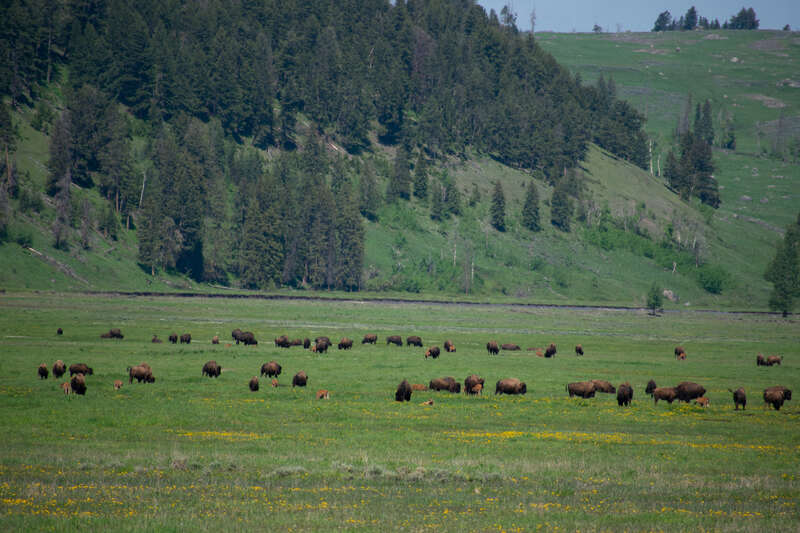 Wolves, Elk, Pronghorn Deer, can also be sighted here, but you are guaranteed to see a bison (or several hundred). Yellowstone Canyon Located in Canyon Village, this iconic canyon is aptly named for the yellow stone that can only be found here in the park (and if you didn’t guess, is why Yellowstone is named just that, Yellowstone). We weren’t expecting the canyon to be this amazing. 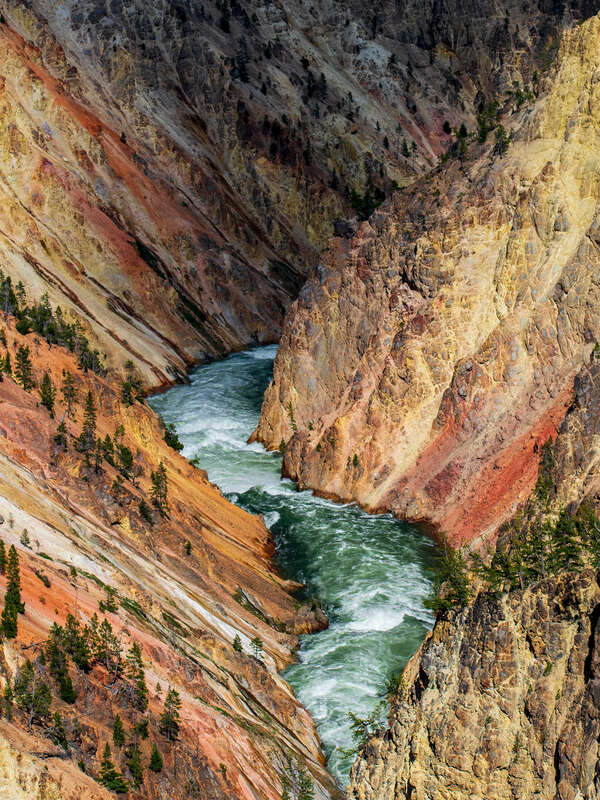 We’ve seen canyons now all over the place, but Yellowstone Canyon; WOW! 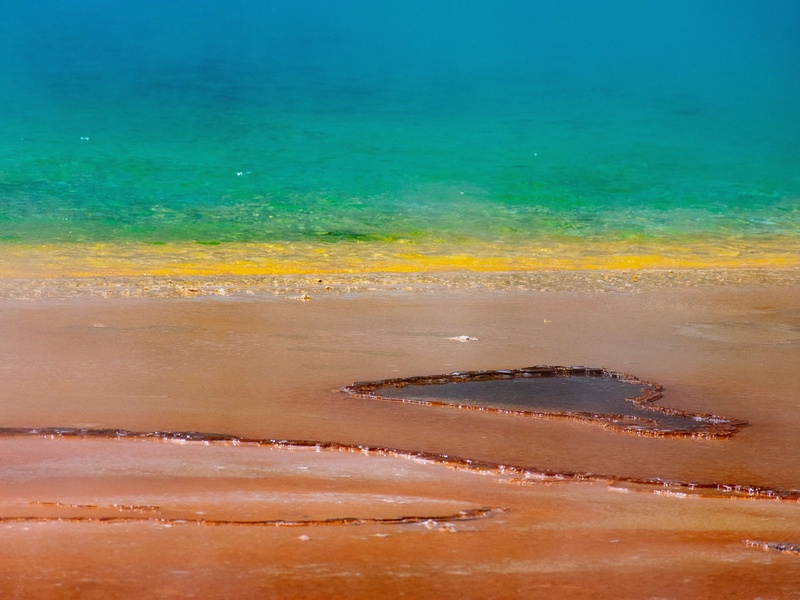 Grand Prismatic was Dennis’s favorite, but this was Liz’s. The waterfall in the canyon creates a permanent rainbow that turns this beautiful scene into a killer one. Seriously can it get any prettier than this!? There are two drives you can make, the North Rim and South Rim which offer several vistas and over looks. Tip: Stop at EVERY overlook you can! If you’re tight on time however, Artist Point, Lookout Point, and Inspiration Point are the highlights. The South Rim Drive was under construction when we were there so we missed out on Uncle Tom’s Trail which we heard is pretty epic views! There are several hikes down into the canyon to give you up close views of the waterfalls (yes waterfalls is plural as there are several). 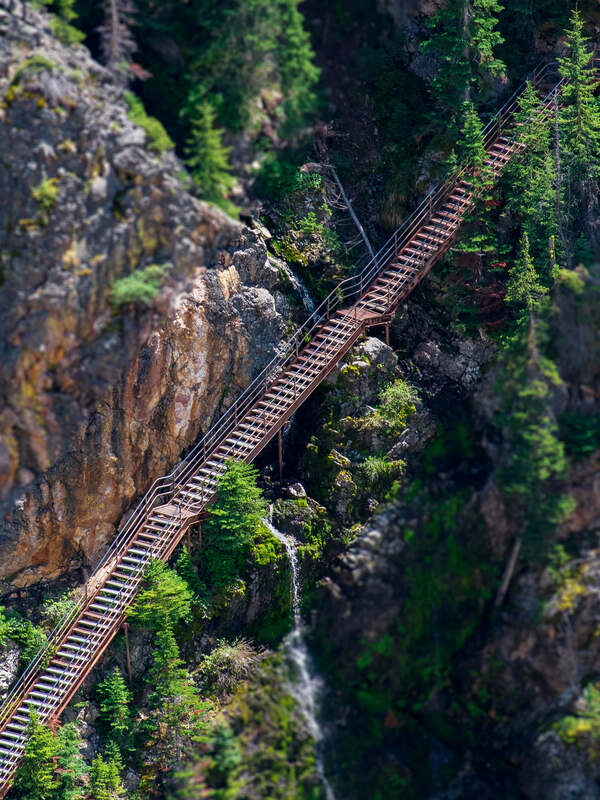 The hikes are often short but steep. 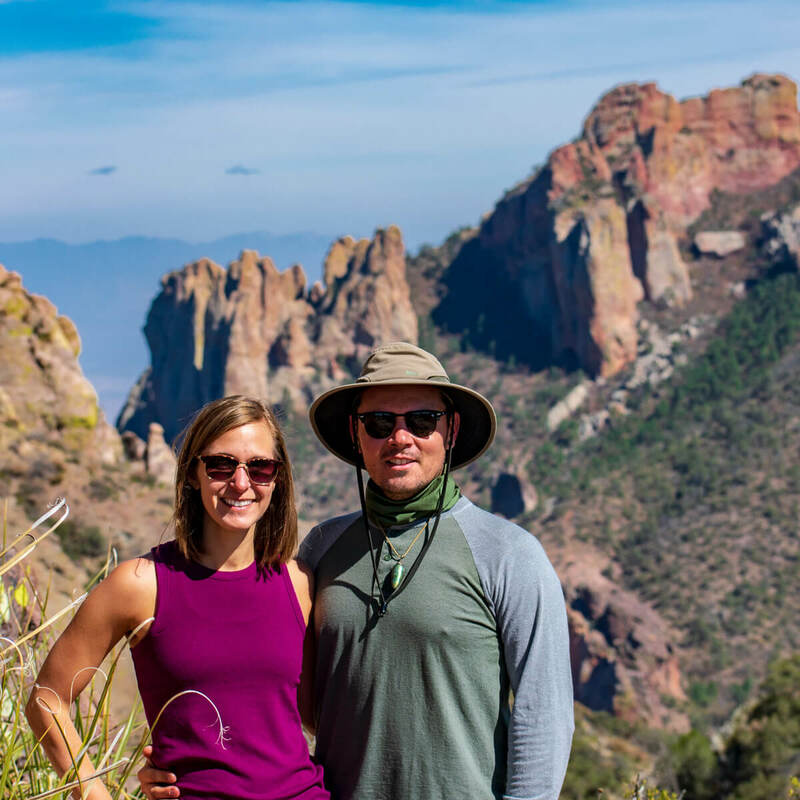 If you prefer to enjoy the beautiful canyon from one of the vistas, there is no hiking or steep walks involved and plenty of overlooks for you to enjoy it from. 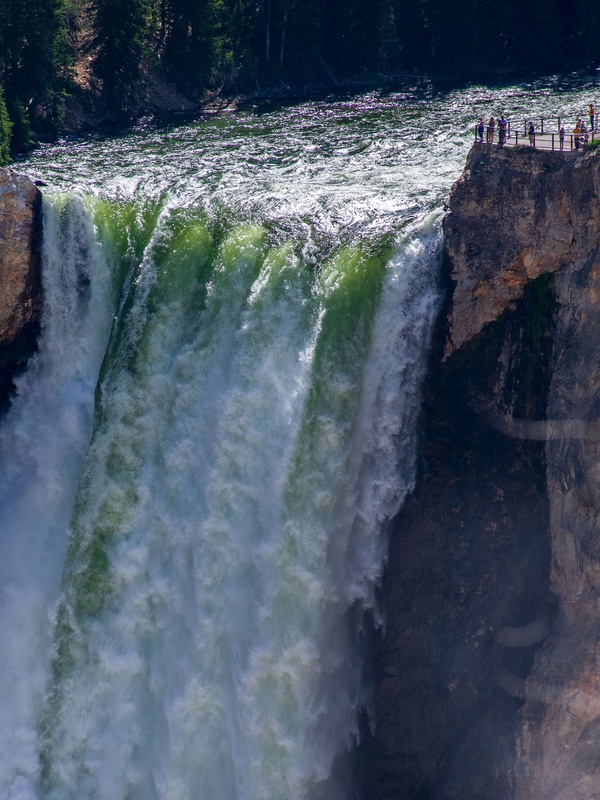 If you’re physically able or have the extra time, we suggest going the extra mile (or two or three) and getting to see Yellowstone Canyon from every possible view and that includes the trails downward. That’s how we got that incredible photo with the waterfall! Plan to spend a decent amount of time here. Since Dennis and I took a lot of the hikes to view the waterfalls, we spent more time here than planned. It could easily take up an entire day if you really wanted it to! If you’ve never gone a white water rafting trip, Yellowstone river is the place to try it out! We loved whitewater rafting down the Ocoee river in Chattanooga, TN and are sure we would have loved it here as well. Since we were tight on time and focused on doing a majority of free activities, we opted to skip the river trip this go around. When we visit again this will 100% be on our list! Just google “rafting Yellowstone river” and you will see a plethora of companies offer rafting trips with reviews and pricing. The east side of the park has much less geothermal activity, although there is evidence if you look closely. This part of the park is more of the traditional forest and mountain experience you would expect from national parks. 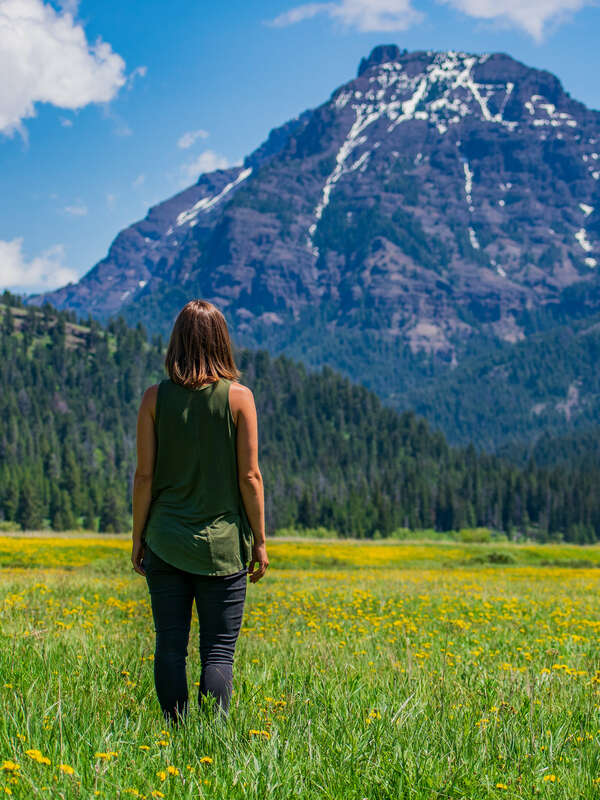 On the east side you can enjoy beautiful mountains, grassy meadows, canyons, waterfalls, lakes, and rivers. The list below is going from West to East on the North side of the park. 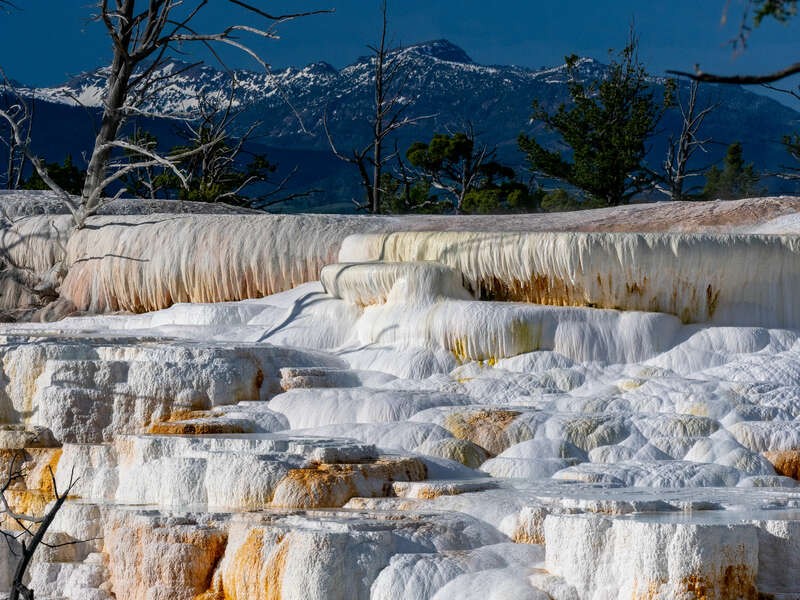 On the far west side of the north area of the park you’ll find Mammoth Hot Springs. 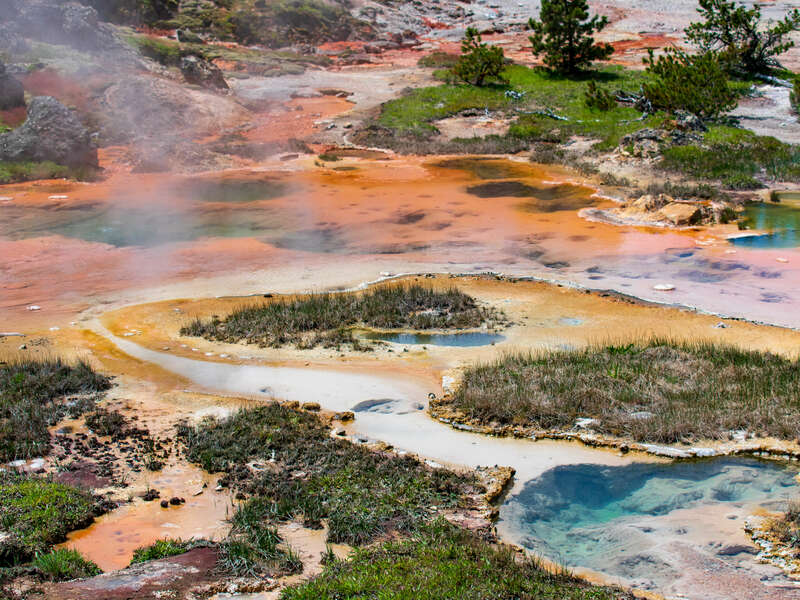 It’s the only major geothermal area outside of the “Yellowstone Caldera” which is the west side of the park. These formations are not only unique because of their location, but also because of how they are formed. 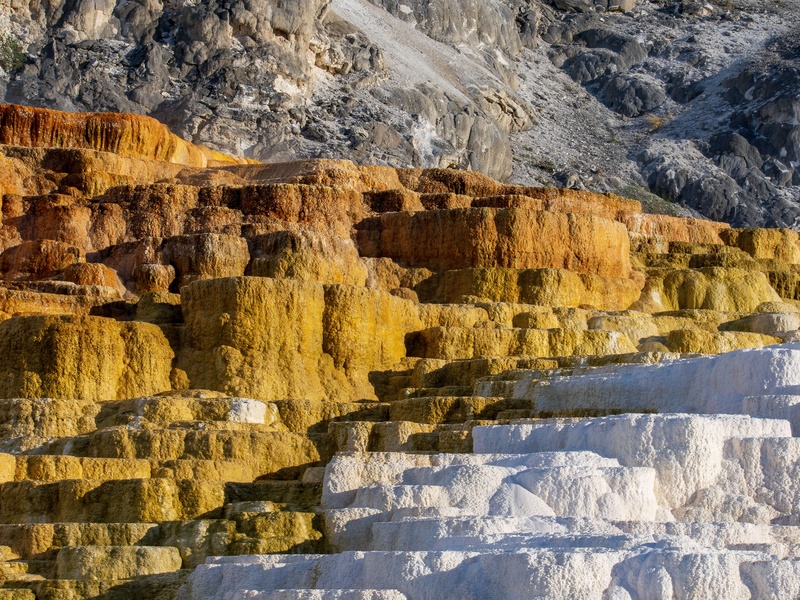 Unlike the geysers, fumaroles, and mud pots you’ll find in the caldera, Mammoth Hot Springs is mostly made up of terraces, specifically travertine terraces. They look like a geothermal set of stairs with geothermal water gently trickling down creating a beautiful scene to behold. 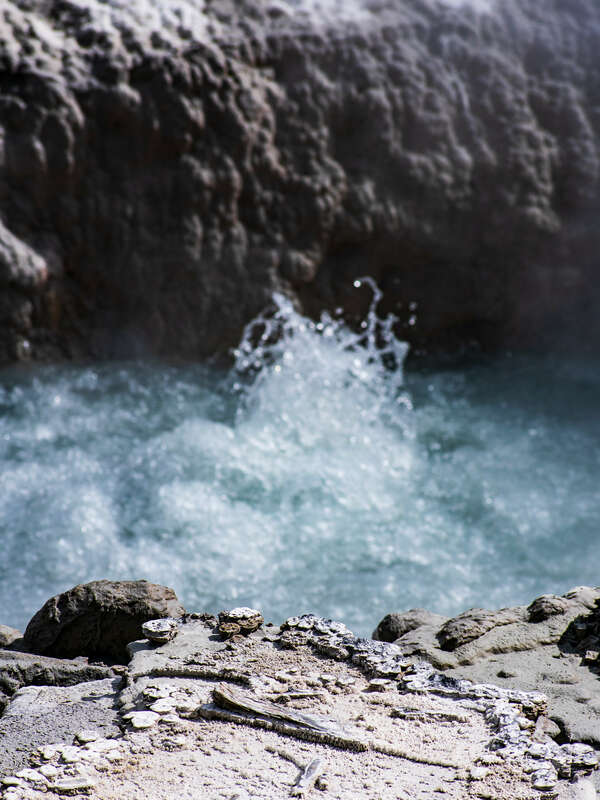 The travertine is a brilliant white with steam gently rolling off the into the air. 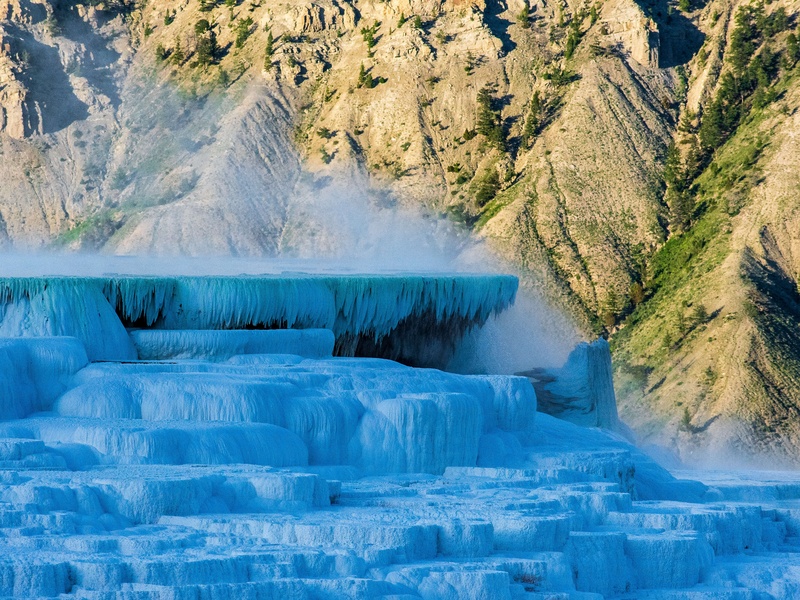 As you can see from the pictures and video, this area of Yellowstone is magnificent and was a highlight of our time here. There is an upper terrace that you can drive through, and a lower terrace that is made up of boardwalks weaving through the hot springs. 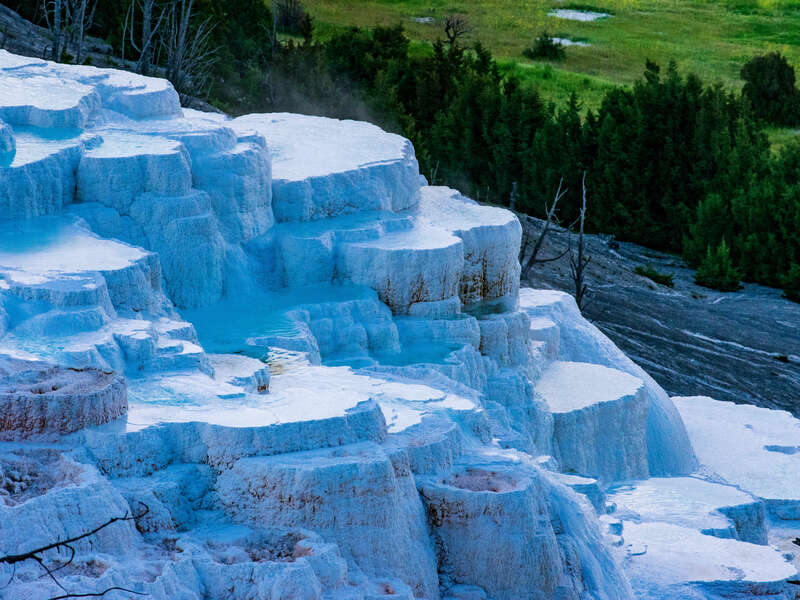 Most of the lower terrace has stairs, so if you are not physically able, just do the upper terrace although you will only see a fraction of the geothermal features at Mammoth. There is limited parking so we suggest you come early or late. Tower Roosevelt and Roosevelt falls is one of the lesser visited attractions in Yellowstone. 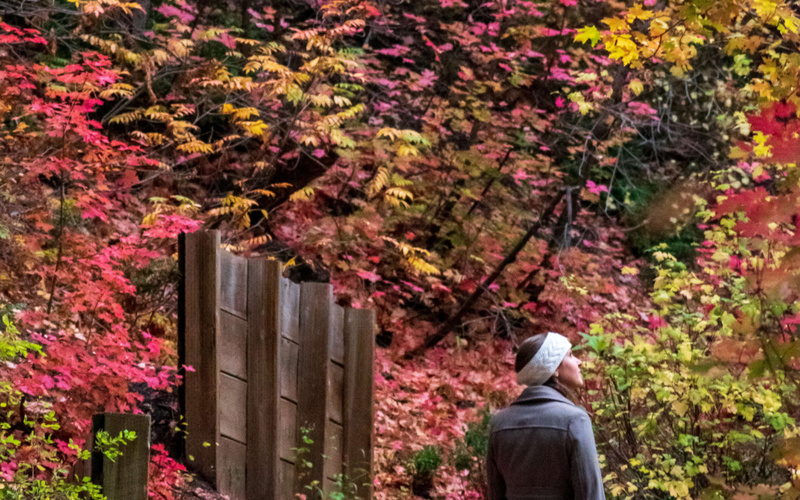 It’s known mostly for it’s beautiful waterfall it also has several hikes, picnic areas, and lodging. 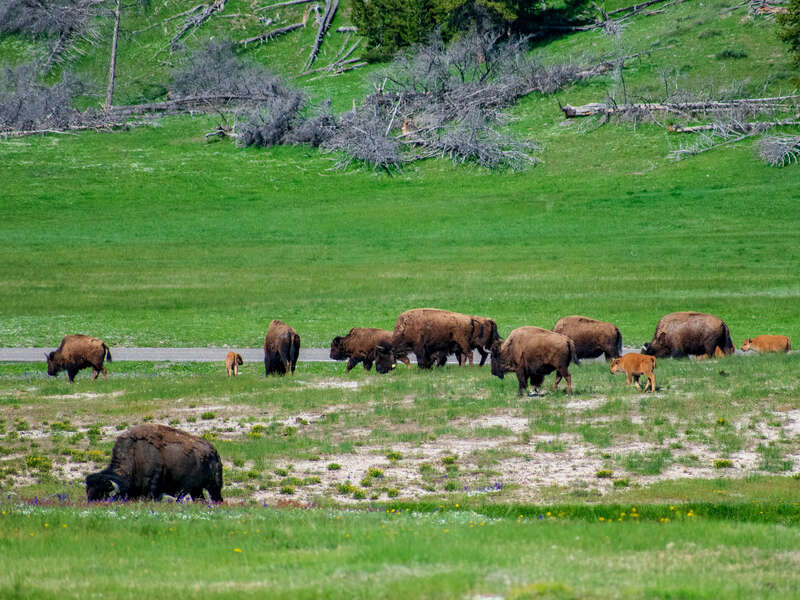 Since there is simply so much to do in this Park already, this is an area that is often explored if people have more than 4 or 5 days, or are returning for a second, third, or fourth time to Yellowstone. This wide open prairie is located in the northeast area of the park. This is where we opted to view wild life and saw lots of Bison, Elk, and Pronghorn sheep. We unfortunately didn’t see any of the more “elusive animals” like a wolf, fox, and grizzly but we did get some pretty epic views of wildflowers, mountains, and endless green hills with buffalo sprinkled throughout. south side of yellowstone The south side of the park again has much less geothermal activity but is home to Yellowstone Lake. The list below is going from West to East on the North side of the park. west thumb geyser basin and grant village If you’re driving into Yellowstone from Grand Teton National Park this is a great place to make a quick stop, walk around the boardwalks of West Thumb Geyser Basin and enjoy the West Thumb of Yellowstone Lake. It’s one of the only areas of the park where you can enjoy a beautiful lake view in addition to geothermal formations. If you are short on time, just make a quick stop here on your way to Yellowstone Lake or as you enter the park from Grand Teton. yellowstone lake At a whopping 136 square miles of lake, Yellowstone lake is the largest body of water in Yellowstone National Park and offers beautiful lake views, a quiet place to escape the hustle and bustle of the park, and fun recreational activities for the whole family. Boats, kayaks and canoes are permitted on this lake. We would have loved to spend a day on the gorgeous water taking in the views and seeing this park from a different perspective. Swimming is not recommended, as it stays around 41 degrees even in the summer! If you’re lucky you might see a beaver or a moose! Shoshone Lake (also in the south side of the park) is supposedly a great place to see Moose in the early morning! 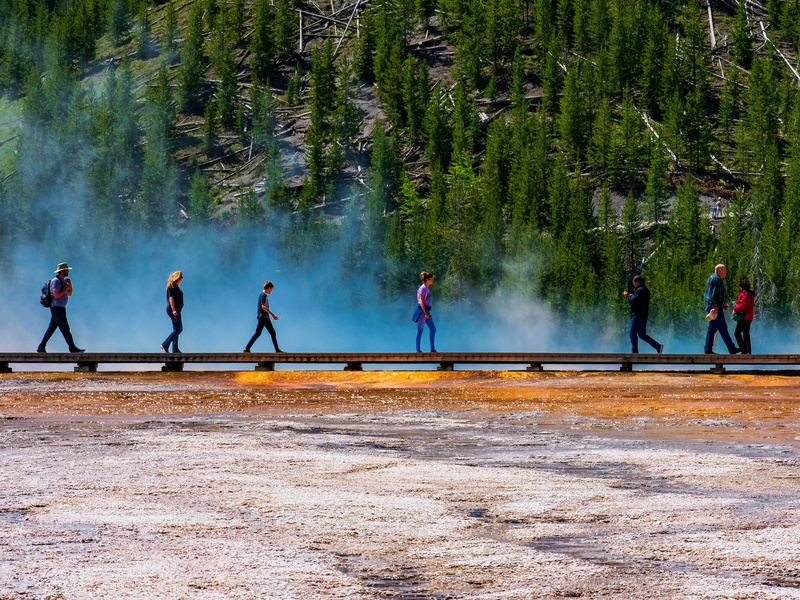 If you’re coming here you should dedicate the proper amount of time to see and do it all, but if you absolutely don’t have the time, then these would be our top things to do in Yellowstone. If your main goal in coming to Yellowstone is to see animals, then do Hayden Valley early in the morning. 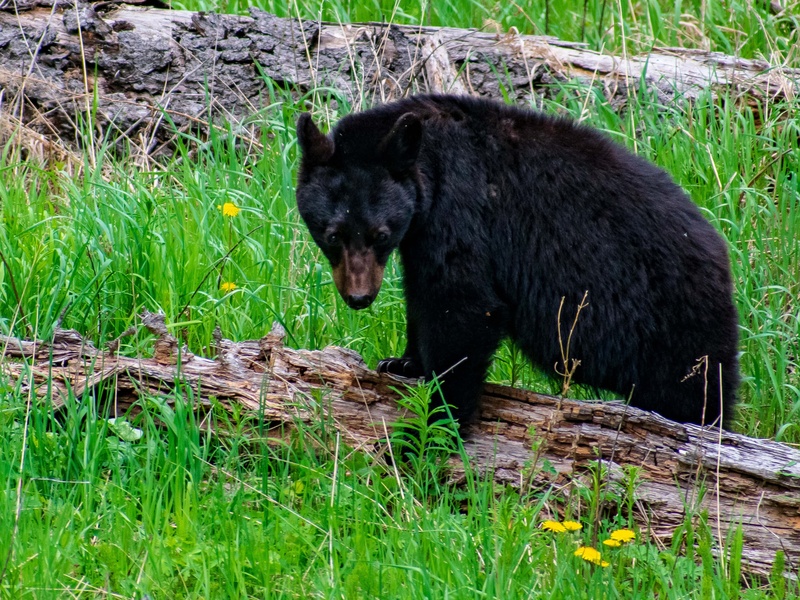 If you want to see animals A lot of people come to Yellowstone to experience the wildlife that is rarely seen outside of these park boundaries. 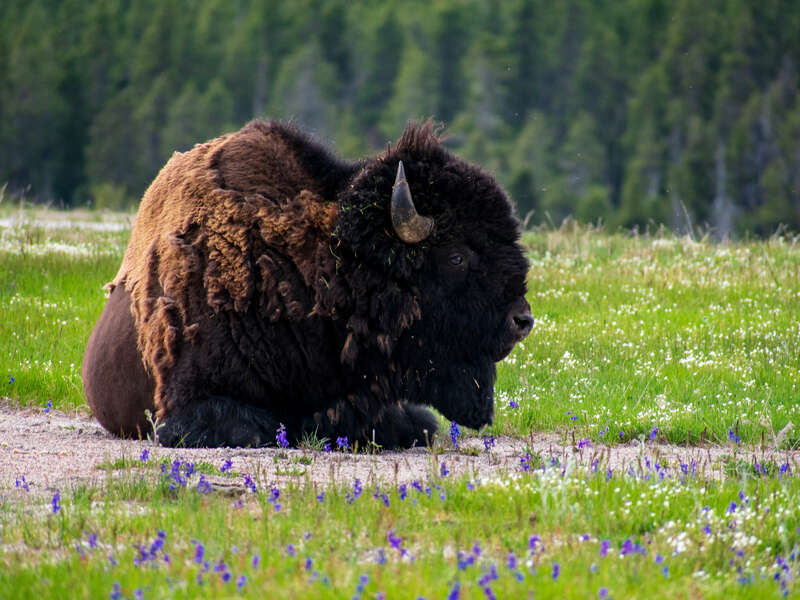 There are hundreds of bison throughout the park in addition to black bears, grizzly bears, wolves, marmots, big horn sheep, elk, pronghorn, moose, bald eagles, bighorn sheep, and fox to name a few. There are two main areas to view wildlife, although most parts of the park have some animal or another throughout. 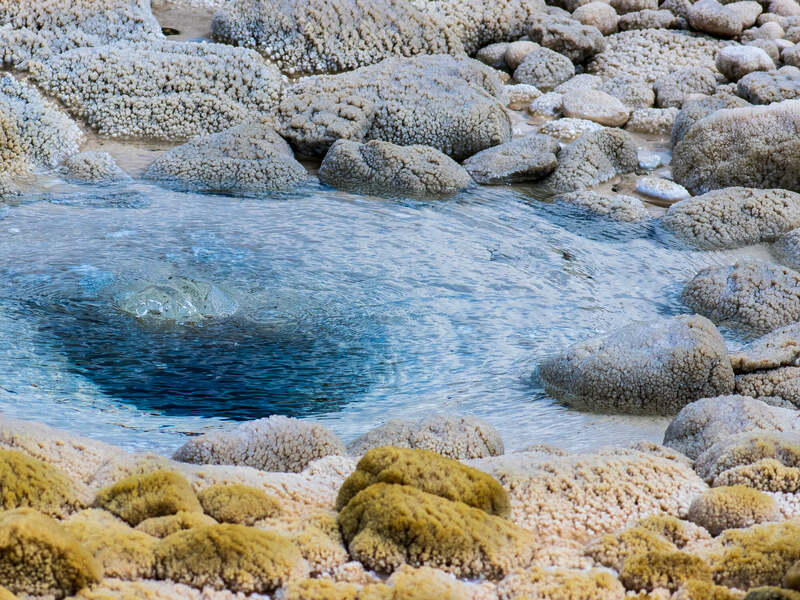 If we could only choose 3 geyser basins… It’s such a shame not to be able to see all of the geyser basins. Every single formation is unique and beautiful in it’s own way. This is definitely not a “see it once, don’t need to see it again” kind of thing. If you’re short on time and simply don’t have the ability to see all the geyser basins these are our top 3.